On the request of ELTF, Mr S R Vijayakumar MP (Chennai-Central) took up the issue in Lok Sabha on 30th July 2014 under Rules No 377. The text of his speech as published by Lok Sabha Secretariat is attached. As you know, ELTF has been taking up this issue for a long time, even during the 15th Lok Sabha. The serious concern is that all the eligible students do not get the full interest subsidy from the Government of India. Though the Government claims to give 100% interest subsidy during the moratorium period, not even a single student gets the subsidy as per the rules. This happens due to the insensitivity of the banks and the Government. Ultimately, the students are asked to pay the interest, though, it is to be got reimbursed from the Government. Instead of disbursing interest subsidy, ELTF has been demandiang 'interest free education loan' till the end of moratorium period. Then the responsibility will lie on the banks to collect the interest from the banks. 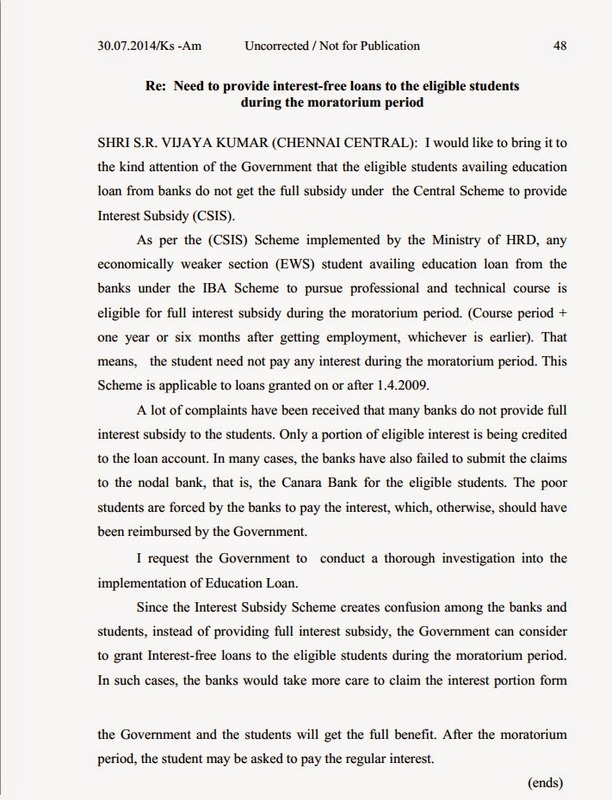 ELTF thanks Shri S R Vijayakumar, Hon'ble Member of Parliament for taking up the issue in Lok Sabha.